Home Snowboard & Ski Goggles RayZor Black Framed Goggles With an Anti Fog Clear Yellow Light Enhancing Vented Double Lens. 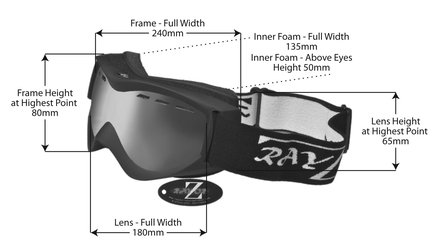 RayZor Black Framed Goggles With an Anti Fog Clear Yellow Light Enhancing Vented Double Lens. Lightweight Black Goggles with Shatterproof Polycarbonate Frame and an Adjustable headband Bearing the RayZor Logo. UV400 Clear Yellow Light Enhancing Anti Glare, Vented Spherical, Wide Vision Clarity Lens. The RayZor Clear Yellow Sports Lens Enhances Visibility in Low Light Conditions, Such as Heavy Clouds or Snow Falls.